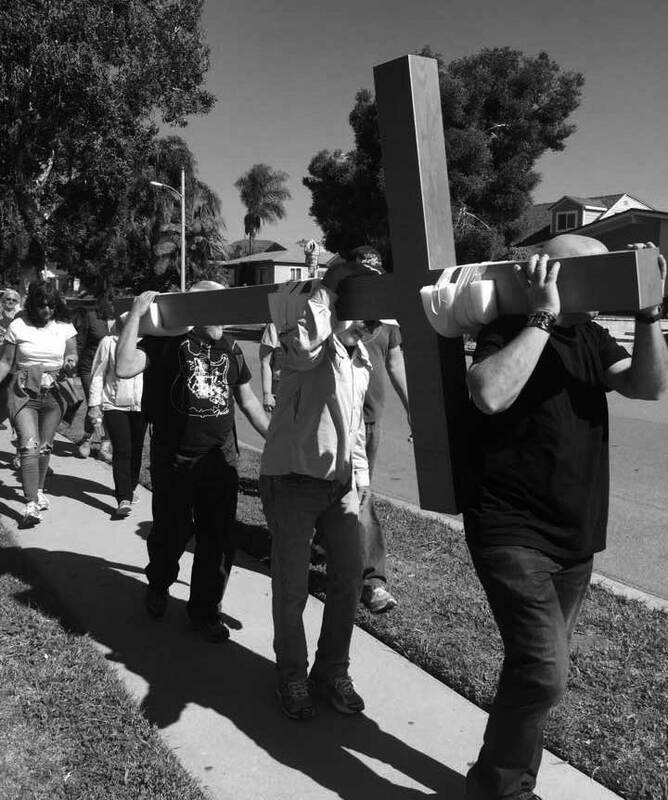 On Good Friday Embrace Simply Jesus Church left what has become our former church home and carried the Cross that has hung in our sanctuary for over 50 years the 11.6 miles to our new home in Oxnard. We called the event The Crossing. As we carried the cross out of our old church building I immediately wondered of the two thieves hung with Jesus on that Good Friday. Which was I? I know sometimes I am the thief who asked Jesus to remember him when He enters paradise. However, I was convicted that I am still able to sin and that apart from Christ I can do nothing worth doing. That I must never forget the cross and all it means to who I am today. I had a keen sense and deeper understanding that every day I find myself up on the cross with Jesus and it is there I make the decision to die to self and live for Him. Yes, every day I must decide if I will pick up my cross and follow Him. It was an amazing day filled with the very Presence of God. From the Thursday night prayer as the cross came off the wall, to the moment we stepped out on the side walk outside the Harbor church building to start the Crossing, to the prayer stops along the way and finally the grand finale as we walked into our beautiful new place of worship and felt engulfed in God’s great love. Every step, every block, every mile lead by Holy Spirit to reach a new beginning and a new “thing” that God will accomplish in the land that He has called us to. My favorite part was when we were welcomed into the new sanctuary with worship. Honestly, after walking the whole distance, I was looking forward to washing up quickly in the bathroom. But the instant I walked into the sanctuary, I felt the presence of the Holy Spirit and I knew I was not going anywhere. Suddenly, my sticky/sweaty skin didn’t seem to matter as much. As we worshiped, I felt a connection with the cross unlike I ever had in the past. What an awesome, once in a lifetime experience.